Chris Gardocki might be a tad biased, but when the former longtime NFL punter was asked Wednesday which punter from the NFC should be named to the Pro Bowl next week, he had only one answer. "Dave Zastudil, without question," Gardocki, who spent 16 seasons in the league, said from his home in Hilton Head, S.C. "He deserves it, absolutely. Will he get it? I don't know. There's a lot of stuff that goes into who goes to the Pro Bowl and who doesn't. "But he should get selected. I mean, he's had himself a phenomenal year." 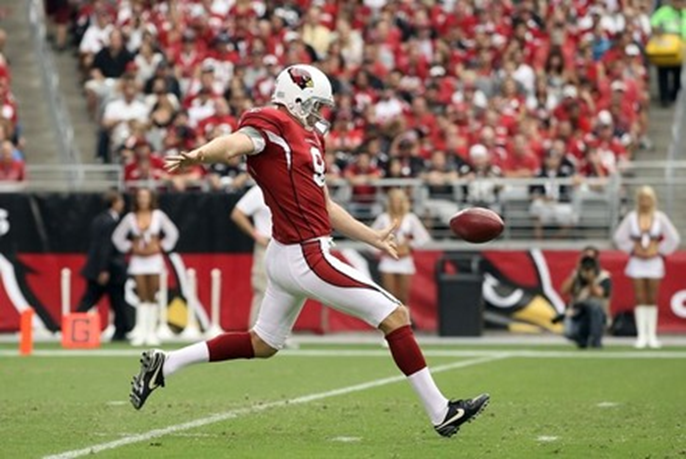 Zastudil, now in his second year as the Cardinals' punter, spent a year and a half out of football recovering from patellar tendon surgery in his left (punting) knee. It was so bad, he wasn't sure if he should retire or attempt a laborious rehab. "When you're out of the league for that long," Zastudil, 34, said, "sometimes it's pretty tough to get back in." Zastudil is glad he chose the hard route and decided to work his way back because, entering Sunday's game against the visiting Chicago Bears, the punter is on the verge of setting an NFL record. After placing a franchise-record six punts inside the 20-yard line in Arizona's 38-10 win over the Detroit Lions, Zastudil needs to drop just five more inside the opponents' red zone to have the most by any punter in a single season. The record for punts placed inside the 20 is 42 and it's shared by three punters, including the Cardinals' Ben Graham in 2009. Andy Lee of the 49ers also did it (2007), as did Steve Weatherford of the Jets (2010). "I don't care who you are, that's just damn impressive," Cardinals special-teams coach Kevin Spencer said. It was Spencer who convinced the Cardinals to give Zastudil a chance last year. The punter had several good seasons with the Baltimore Ravens and Cleveland Browns until his knee started to erode and Spencer had a feeling. "He worked his fanny off to get back, but man, it's been satisfying to watch." Zasdtudil's 46.4 yards-per-punt average this season puts him within striking distance of Graham's 2009 club record (47.0) and although he might get overlooked for Pro Bowl consideration in part because of the Cardinals' 5-9 record, he's been the team's MVP on special teams. "He has such a strong leg that it gives us more room to run down and get away from whoever is guarding us and be able to make a play on the ball or make a play on the returners," Cardinals special-teams gunner Justin Bethel said. "It's a dangerous weapon to have. I mean, when a guy can put the ball inside the 20 and make it stay there, it totally flips the field for your team. It's a huge advantage." Gardocki, who retired following the 2006 season after punting for the Bears, Colts, Browns and Steelers, has played a big hand in Zastudil's comeback. Spencer, a longtime friend and Gardocki's former coach in Pittsburgh, invited him to work with Zastudil during training camp in Flagstaff. It also helped that Cardinals head coach Ken Whisenhunt was once Gardocki's special-teams coach with the Browns. "I would do anything for those guys," Gardocki said. "They're great people. But so is David. I got to know him when we were division rivals and we used to talk a lot and we became friends." The two spent about three weeks together in Flagstaff and to this day, they talk on the phone at least once a week. "It's been so cool to get feedback from him," Zastudil said. "I've never had a guy I could do that with. I take what he says, write it down and take it to practice with me and work on it. "I've always had a lot of respect for him and it's been great to bounce ideas off of him. He's been a huge help to me." Zastudil's play, which has included an NFL-high 98 punts for a league-most 4,546 yards, certainly has the full attention of Bears head coach Lovie Smith. During a conference call with Arizona reporters on Wednesday, Smith said that the special-teams matchup with the Cardinals will probably be the key to Sunday's outcome. "It's a big challenge," Smith said. "There's a lot of different matchups we have, but that may be the most important matchup, just special teams vs. special teams." The Bears and Cardinals have two of the game's elite punt returners, Devin Hester and Patrick Peterson and although neither has taken one back for a touchdown yet this season, both are capable of doing so on any given punt. "I know that (long snapper) Mike Leach and (kicker) Jay Feely and I always feel every game comes down to special teams," Zastudil said. "Field position is so crucial and I know I'm going to be punting to a great returner, but we're excited for this challenge." Zastudil, though, is just excited to still be punting in the NFL. Spencer admittedly wasn't completely sure Zastudil could make it back. Neither was Zastudil. "I was just blessed the coaching staff here gave me a chance to play again," he said. "But I knew I had to earn it."